Alongside the other providers like Vegas Technology or Realtime Gaming the Top Game Company is oriented to the national consumer. 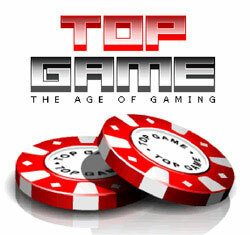 Top Game casinos are considered to stand out from the other online casinos. The developers put many innovative and interesting ideas into the concept of the layout and design of the online casinos. The most significant is the casino lobby designed by the Top Game. It is considered to have the live support window where the player can easily get appropriate assistance from professional supporting team. The ability of the opening several games simultaneously in various windows contribute to the process of gambling a lot of fun and excitement. It proves the fact that Top Game is going to conquer the world of gaming. It is brand new and fresh generator of ideas. Players can change the sound settings just in the casino online lobby. There are additional sound functions, apart from standard on/off mode. Top Game indeed surpassed the other providers in relation to sound effects. There is the range of music background to choose. Classic, Spanish, and jazz background is available. There is no such a variety of online casino games as with gambling giants like Cryptologic, Playtech or Microgaming, however, if the players are fond of video poker or slot machines, they will certainly find these games interesting with Top Game. In this case not offering the classical online casino games like Baccarat, Pai Gow is not a big deal. The matter is that Top Game impresses with the quality of the games, but not their quantity. Besides, the future will be taken by Top Game with the help of new game developments. This company talks much about the introduction of more than 100 different online games in future. However, a lot of players that are interested in this very company are disappointed by the fact that there is no full range of the classical online casino games. Anyway, with such a rapidly developing company it is something that can be fixed easily.